Heat oven to 450°F. In medium bowl, mix 1/2 cup sugar and the flour. Gently stir in pears to coat. Remove 1 pie crust from pouch; unroll crust into ungreased 15x10-inch pan with sides. Spoon pear mixture onto center of crust to within 2 inches of edge. Carefully fold 2-inch edge of crust up over pear mixture, pleating crust slightly as necessary. Sprinkle 1 teaspoon sugar over crust edge. 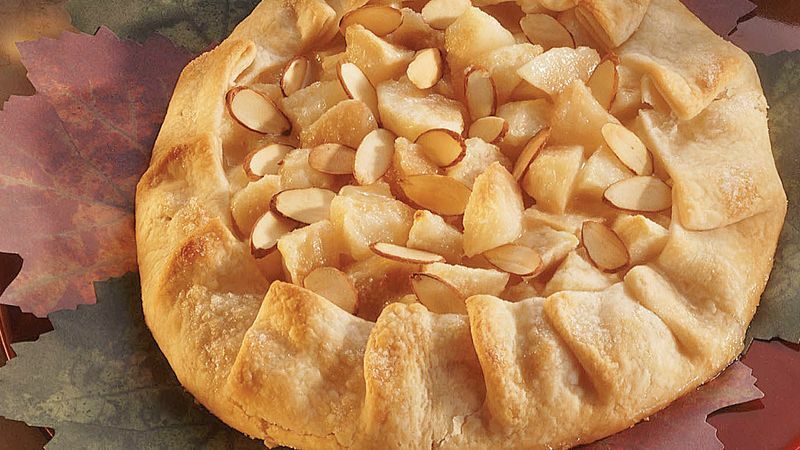 Bake 14 to 20 minutes or until pears are tender and crust is golden brown, sprinkling almonds over pear mixture during last 5 minutes of bake time. Cool 15 minutes. Cut into wedges; serve warm. Serve each slice with a scoop of cinnamon or vanilla ice cream.